We’re having a great autumn in Ohio, with warm weather, which has made for a good apple season. Yea! I wanted to try something a bit different than another apple pie (though nothing’s wrong with another apple pie), so I took the prompting provided by Nicole at Pinch My Salt to do a galette. Galette is French (yeah, I said French!) for free-form pie, basically. I’m the first to admit that what I made is probably not a traditional French galette, as it is probably too thick, and galettes are typically more pizza-like. I also wanted to try a new crust, though I love my grandma’s easy-to-make crust, made with hot water and shortening. I looked up a pâte brisée recipe in a Jacque Pepin book I have, Complete Techniques… A great book, by the way. I cut up the butter into pieces, then put it all in the freezer for about 15 minutes to make sure it was really cold. I mixed all the dry ingredients with a fork, then used a pastry blender to mix in the chunks of butter. When the mixture was starting to get crumbly, I added the water a little at a time while I mixed it by hand. I stopped adding water when I thought the dough was holding together so as not to over-mix it. Once the dough was together, I put it in a ziplock bag and stuck it in the refrigerator while I got the galette filling ready. For this, I did a mix of things instead of just doing a regular apple pie type filling. I put a couple Northern Spy and a couple Jonagold apples through the apple peeler corer slicer and quartered the slices, then added about 1/4 cup demarara sugar and a sprinkling of cinnamon, along with maybe 2 tablespoons of flour. I also mixed up some cinnamon roll filling (I used filling from King Arthur Flour, which is pretty good stuff, though I need to make my own). I rolled out the crust on a sheet of parchment paper, then spread the cinnamon roll filling on it. I put the apples in the center of the crust, then folded the crust over the apples, leaving the center uncovered. I brushed an egg white over the crust on top and sprinkled it with some more demarara sugar (just a bit). The galette was ready for baking! The Big Green Egg was already heated up to 400 degrees F… I’ve learned to get it going before starting the prep work to ensure I get it settled in to the temperature I’m wanting. The galette went onto a pizza stone in the BGE for about 35 minutes. The results? I was really happy with the galette. And I feel guilty… I’ve been using my grandma’s pie crust for as long as I’ve made any crust, but I think I just replaced it with all-butter pâte brisée. The crust was just flakier and had a bit better flavor, I think. I’ll have to consider a side by side test, but I feel like I’ve betrayed Grandma! Was this easier than doing a pie? I don’t really think so, other than the step of covering the whole thing and pinching the edges together isn’t done. It’s more rustic, though, and kind of a nice change. And I’m starting to really appreciate the little bit of smoke flavor that gets imparted by cooking using lump charcoal when baking. Yum! Looks great! I love the idea of spreading the cinnamon roll filling on the crust! 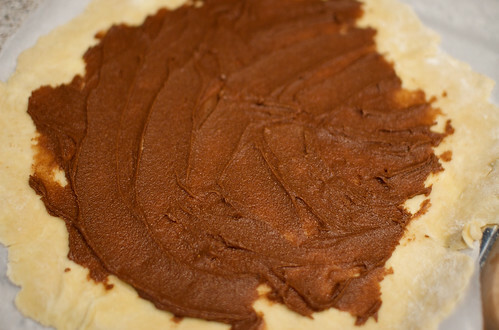 Nicole, I think the cinnamon roll filling did a couple of things… 1, you can never have too much cinnamon, so it adds more, and 2. it adds the fat that would be needed in the filling and spreads it around evenly. That last photo is incredible. I can see why you were happy! Susan, thanks! 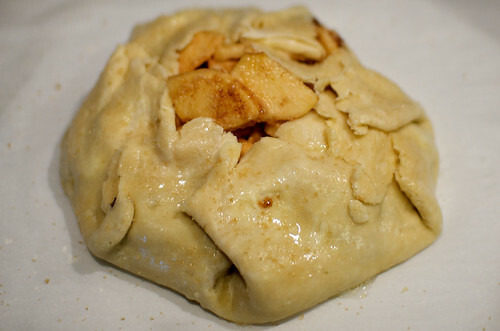 Apple pie (now galette, too) is something I never order out, as it’s always been better at home. 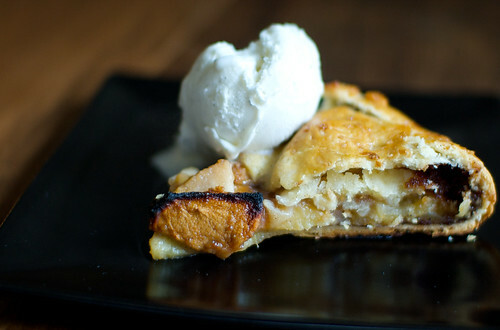 Just like with pie, using apples that keep their integrity after being baked is really important. 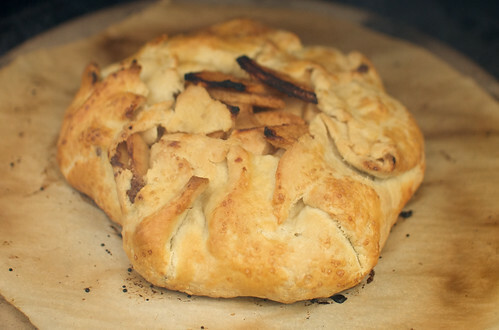 I love my apple peeler corer slicer, but I may have to try this with apples cut by hand; the rustic quality of the galette almost calls for hand cut apples. Your grandmother’s pastry is probably better suited to some fillings. As wonderful as this pastry is, I suspect some of the more gutsy American fillings like sweet potato might overwhelm it. I certainly wouldn’t feel bad about liking both; they just have different uses. I’m curious. Did the sugar’s texture come through in the crust? Did you crush it first? Gosh that looks so good. Too good! You can never have too much cinnamon with apples indeed! Doug, good point; I may have to try to find something on the difference between hot water crusts and cold water crusts. I know I can switch the shortening with butter in my Grandma’s recipe; I’ll do a side by side test, I think, to see if I prefer one over the other then. The main advantage in the very cold butter is that it leaves pockets of butter, resulting in more flakiness. Y, every time I thought I had enough cinnamon, I could add more and find that was good, too! Cinnamon is about my favorite flavor, along with wood smoke! I’m going straight to the kitchen. The Hilty’s need some apple pie!! Gretchen, Stolz’s is the only place I know around that has Northern Spy apples, which are great for pie. Sara, my grandma was a great cook. I need to try her crust the way she made it, with lard! She also made fantastic egg noodles, which I miss, though not as much as I miss her! mikky, I cheated. I used a mix from King Arthur Flour (http://www.kingarthurflour.com/shop/detail.jsp?id=3037), but it can be done by mixing about 3 tablespoons of cinnamon with a cup of brown sugar and about 1/3 cup of melted butter. The King Arthur Flour stuff is good, though, and it’s just 1 tablespoon of water per quarter cup of filling, so it’s not even very messy. Last minute scramble to try and find my favorite galette recipe, to no avail, I do a number of web searches and find your delicious blog! You saved our desert tonight!!! Thank you! 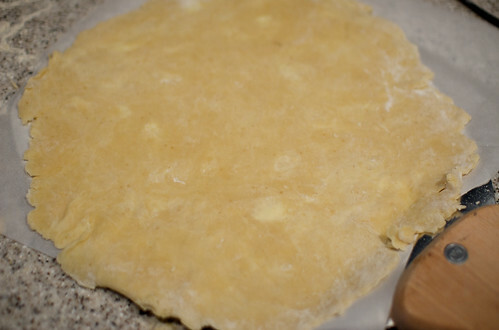 Lea, I hope the galette turned out well… and glad to know my blog comes up in searches.